Q：Does it have warranty ? A：Yes. Tek Maker Co., warrants the product for one year from the date of purchase. Tek Maker Co., will repair or replace the product at its option and expense for any defect due to faulty material or workmanship within the warranty period. But, the warranty is not valid if a defect is due to damage caused by incorrect use or unauthorized repairs. Furthermore, the warranty does NOT cover products that are subject to wear or that can be considered as consumables by their nature, such as the rechargeable batteries. Battery shelf-life will be shortened according to the storage time and using conditions. Q：What are the benefits of the FreeDryer ? A：Its major benefits are cordless, EMF free, and safe in water . FreeDryer is the only rechargeable hair dryer in the world. Since it is cordless andhas no restriction from power cord, so you can dry anything, anytime and anywhere, especially outdoors. Most of all, the cordless hairdryer is EMF free. It has no electromagnetic radiation as generated by the traditional hairdryer. It is the most healthy dryer to use to take care of your baby and your family. Furthermore, with no current leakage at all, it is safe even when it drops into the water. FreeDryer is the safest hair dryer in the world. Q：What about its heating level ? room temperature 25℃(80℉), which equals to a 400-watt heating output. Q：How long can it be used with each charge ? A：It has fifteen-minute run time at low speed and eight-minute at high speed. Q：Can I use it while traveling in other countries ? you might need a plug adapter to connect with domestic power outlet. Q：Is the battery replaceable ? easiest way to replace a second battery for extended use time. Q：How do I start to use ? 2. In order to install the battery set correctly, the guiding bumps on the battery set allow only one direction to insert. Q：How do I remove the battery ? Q：Why does my FreeDryer switch to cool airflow automatically ? A：It is designed so for safety reason. A thermal fuse in the blower will shut off theheating power when it overheats. However, the fan will continue to blow cool air while the thermal fuse remains in effect. The hot air will come back once the blower is cooled down. Q：Why does my FreeDryer stop blowing ? A：The blower will shut off automatically when the battery capacity is low or not fullycharged. Recharge the battery set or replace a second battery set for further use. Q：Is it normal for the battery getting warm while using ? A：Yes, and so do not be alarmed by battery’s getting warm while using. However, itwill keep battery life longer, if you stop using then and wait for the battery set to get cool again. Q：How do I charge the battery ? 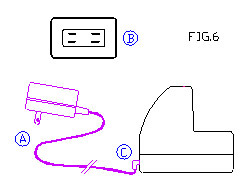 A：Before charging, plug the adapter (A) to the power outlet (B) and connect theoutput plug of the adapter to the socket(C) of the charging cradle. (Fig. 6) The indicator light turns Green when the charging cradle is ready for charging. Then, put the battery set onto the charging cradle for charging. Q：How much time does it take for the battery to be fully charged ? A：It takes about four hours to fully charge the battery. The indicator light turns Redwhile the charging cradle is charging the battery set. The charging cradle will detect the battery capacity level and cut off the charging automatically when the battery set is fully charged, and the indicator light turns Green. Q：Can I use other adaptors or chargers to charge FreeDryer battery ? A：No! You should use only manufacturer’s charging cradle and adaptor. Using otherchargers or adaptors may cause danger. Q：Can I use its battery as a power source for other appliances ? A：No! Using of the battery set for FreeDryer as an electrical power source for otherappliances may cause fire, personal injury, and damage to the battery set. Q：What should I do if my FreeDryer drops into water ? A：Should the FreeDryer fall into water, it is safe to pick it up from the water. However, shutting off the dryer immediately is recommended. Once it’s out of the water, pull out the battery set from the blower housing, shake off any water and allow it to be air-dried overnight. Contact the authorized service facility for help or return. Q：Under what condition should I stop using the battery set ? A：Stop using the battery set if it breaks or the insulation rings are off from the battery set. Also do not continue to use the appliance with a depleted battery set. Q：What else should I be aware of in using the battery set ? A：Never use any metal objects to probe or connect the battery contacts. Do not use orstore the battery set close to fire and/or hot sources, and do not place the battery set in aprons, pockets, drawers, etc. with nails, screws, keys, etc. Q：What should I do if I want to carry it with me for traveling ? A：Pull out the battery set from the blower housing for carrying. Q：What should I do to store it ? A：Pull out the battery set from the blower housing and always store the appliance indoors or in a cool place. To keep the rechargeable battery in good condition, the battery set should be recharged at least every three months. Q：Can I drop the battery in trash can at the end of its life? A：To keep our earth clean, please return the spent battery set to an authorized service center or official collection point for recycling. Moreover, the battery set must not be incinerated or composted.